Four frogs, a dragonfly, two lily pads and a lily. This quilt measures 24" x 28". Yours could be a different size if you arrange things differently. The quilt in this photo is 24" x 28". We have made several quilts with this pattern and they all come out with different measurements because the arrangement of the blocks has been different. Should you leave out a block the whole configuration changes. If you make one block twice (reversing the design and using in a different fabric) the whole configuration changes. Also, if you used all the designs in this pattern twice, the quilt could be really big. 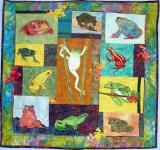 Combining this pattern with other Critter Pattern Works patterns will vary the size of the finished quilt even more. How do we combine blocks of different sizes? If you have a long block and a shorter one and you want them to go together, add a strip of fabric in a different value (darker or lighter than the ones around it) to the shorter one. Sew those two fabrics to the longer applique block and square them up on the outside edges. This is now a unit. Make more units. If the units don't fit exactly together, add more strips to make them work together. When all your units sewn together and are big enough to make it the quilt size you desire, add a border and quilt it.